Dragonflies are beautiful delicate creatures so it is no wonder jewelry designers are inspired by them. One of my favorite pieces in my own jewelry box is my dragonfly pendant. It was a gift from my son many years ago and reminds me of our days spent in our garden admiring and studying dragonflies when he was a preschooler. His adoration of dragonflies caused me to notice a spectacular creature that I had previously overlooked. 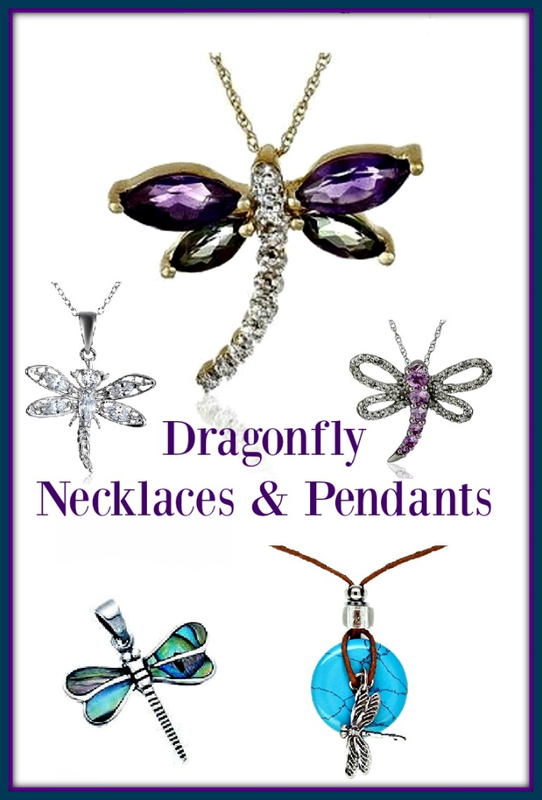 This page showcases some wonderful dragonfly pendants, the perfect gifts for anyone like me who loves dragonflies. If you are looking for a gift for someone special, then you are bound to find something here to suit every taste and every budget. Marquise shaped mystic topaz and amethyst stone accents deliver bold purple and iridescent sparkle on this lovely dragonfly pendant necklace, set in 10k yellow gold. 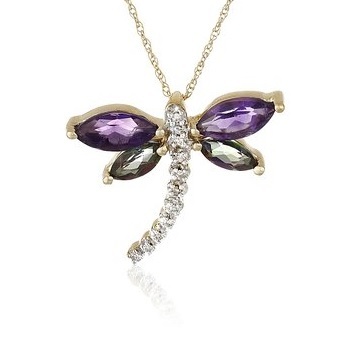 Small white diamonds form the dragonfly’s body and provide a stunning accent for the amethyst and topaz. This necklace is also available with Blue topaz and peridot, which is also cut in a marquise shape, and truly make a lovely combination of gems as well. Many of us love the color pink and a pink sapphire is a lovely gem! The gems in this pendant are reversed to the way they are set in the Amethyst and Topaz Dragonfly Pendant above. The pink sapphire forms the body of the dragonfly and the diamonds were used to create the wings. This necklace would be an awesome gift for a daughter, wife, sister or mother who loves the color pink. This is a beautiful pendant that is actually quite large. To be exact, it measures 4.2 x 3.5 x 1.7 inches. It features light sapphire and aurora borealis genuine rhinestone crystals. This will make a wonderful gift for anyone who loves the color blue and for anyone who loves or collects dragonflies. An 18″ chain is included with this pendant, but the really amazing feature is the price. This is a really beautiful necklace for a very low price. Abalone shell is really rather popular due to it uniqueness. As with any abalone shell piece, no two are exactly alike, simply because no two shells are alike. Abalone shell has a beautiful iridescent appearance and makes stunning jewelry of any kind, but I especially like the iridescence of on the dragonfly wings on this particular pendant. You can find out more about Abalone Shells and Abalone Jewelry by simple clicking here. If you prefer the simplicity of sterling silver, here is a lovely pendant necklace that may appeal to you. It is considerably less expensive than some of the previously featured pendants. As you can see, there are no diamonds to increase the cost, but it still has the look and appeal of precious stones. It would be a great gift for any woman, but would also be perfect for a pre-teen or teenager. Personally, I often prefer wearing created stones like Cubic Zirconia, especially when I travel. It has the clear beauty of a diamond without the cost which allows me to wear it without concern of loss or thief. It is a rather unique ability that dragonflies possesses to be able to fly backwards. Many of us embrace our uniqueness and the desire to wear a style that is all our own. I have included this necklace for the woman who truly knows herself and enjoys standing apart from the rest. The dragonfly charm on this pendant is made of pewter and hangs in front of the turquoise disk. It comes with a 24″ adjustable leather cord instead of a chain.